The Shippen, a stone barn conversion in Broadhempston, is virtually self-sufficient, what with its own water from a bore hole, sewage treatment plant and a ground-source heat pump which runs the underfloor heating and hot water. As you can imagine the underfloor heating combined with a high level of insulation provides a wonderfully stable and ambient environment to make all cosy and comfortable. The accommodation is of a very high standard with décor of the same quality throughout. Four double bedrooms are housed on the ground floor with the master bedroom being en-suite. Many interesting and attractive features including exposed oak trusses and purlins, brick window arches and a slate roof, enhance the property. To the first floor is a substantial kitchen/dining room with vaulted ceilings providing a feeling of light and space, with solid oak floor and many integrated appliances. There is a snug sitting room with beautiful views and two spacious mezzanine levels, tucked away amongst the timbers of the roof. The Shippen sits in approximately 0.7 acres in a quiet, rural position and there is a large driveway providing off road parking for many cars. A 3-bay timber frame cart shed to the side provides two open bays and a workshop/store. The rear garden is a mixture of level and inclined lawn areas, vegetable plot, fruit trees and a greenhouse. 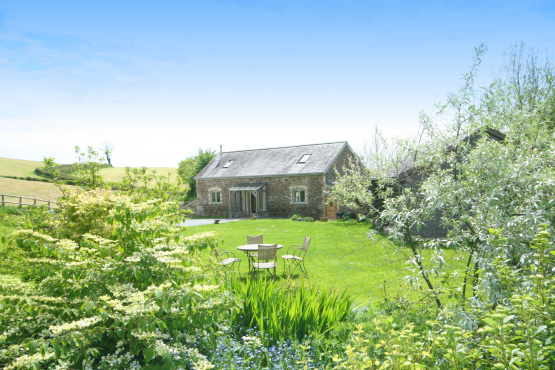 The garden also enjoys stunning views over the rolling countryside. The Shippen SOLD off a guide price of £585,000. For further information please contact Marchand Petit’s Totnes office on 01803 847979.